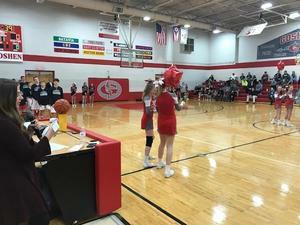 Last night was our last home game so we recognized our 8th grade cheerleaders and boys basketball players. Join us on Tuesday, February 12th in the GMS gym at 6:30 pm for important information. Join us for important info about your student's transition to GHS tonight! There is also a link to the high school page with all scheduling information on it including the course registration book. 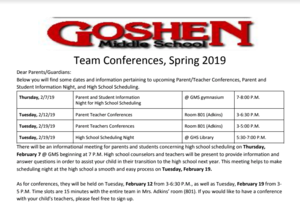 Check out the Goshen High School Course Registration Book to get ready for scheduling. Information Night for High School Scheduling has been rescheduled for January 31st. Please see attached flyer. GMS students participated in our Academic Pep Assembly on Friday, January 11. 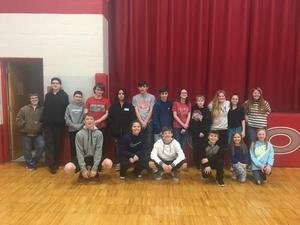 We recognized 55 students who were on the “A” honor roll and 177 students who achieved the “A/B" honor roll for second quarter. The highlight of the Pep Assembly was our school wide spelling bee with Breena Lingo becoming our school wide champion!! Congratulations, Breena! We are so proud of our Middle School Warriors for stepping up to raise money for the American Heart Association during our Hoops for Heart event. By donating money to go to the gym during Encore time to be active and exercise their hearts, GMS raised $1414.47. HEY PARENTS! Check it out! To help keep parents informed, we have added two new tabs under the Parent section on this site. Now you can find links to the newsletter and copies of flyers that are being sent home. 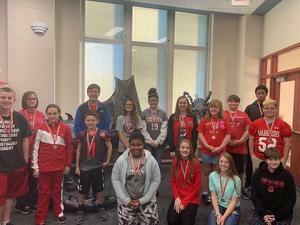 Congratulations Brady Crawford, Cam Botner, Catie Huening, Cody Beckelhymer, Cohen Hamann, Damien Caddell, Libby Wittmeyer, Esther Daniels, Jasmine Faulkner, Grace Belcher, Jaylen Gregg, Jordayn Schoonover, Julia Allgeyer, Kayleigh Warren, Madysen McGee, Matthew Whitton and Nate Paprocki.